Aeonium, native to Africa, is a type of succulent plant marked by rosettes of plump leaves and upright, woody stems. Aeonium is available in a variety of sizes, from plants with dainty, 2-inch rosettes to rosettes with a span of 12 inches or more. Colors range from pale green to a deep, nearly black color. The plant is appropriate for growing indoors, or outdoors in the mild climates of U.S. Department of Agriculture hardiness zones 9 to 11. Like most succulents, aeonium is easily propagated by division. Fill a pot with a potting soil similar to the original potting soil. Aeonium does well in a commercial potting mix for cacti and succulents, or a pot filled with one-third coarse sand, one part regular potting soil and one part pumice. Break or cut a rosette from a healty aeonium plant. Leave at least 1 inch of stem attached to the rosette. Set the rosette aside in a shady spot until the break forms a callus -- about two or three days. Plant the rosette in the prepared container, with the woody stem in the soil and the rosette above. The stem will grow new roots. Place the pot in partial shade or filtered sunlight and normal room temperature. Avoid hot, direct sunlight, which will kill the plant. Water the potting soil lightly after planting. Thereafter, water aeonium on the same schedule as the parent plant. Allow the soil to dry slightly between waterings, and never allow the soil to become soggy. 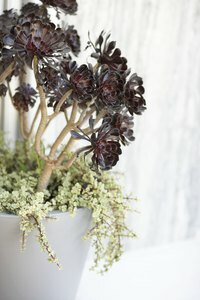 A terracotta pot works well for aeonium because terracotta is porous and provides ventilation for the soil. Always use a pot with a drainage hole, as aeonium, like most succulents, is susceptible to rot in soggy soil. Avoid propagating aeonium when the weather is extremely hot or cold, as the plant is likely to rot. Water aeonium sparingly during the summer, which is the plant's dormant period. A light watering every other week is usually enough. Outdoors, aeonium does best in temperatures between 40 and 100 degrees Fahrenheit.